SuperCut Universal Multiple Digestion Buffer is a Tris/BSA based universal restriction enzyme digestion buffer, It provides an optimal conditions for commercial available restriction enzymes mostly used in the gene cloning. High efficiency for restriction analysis can be demonstrated both at single and multiple digestions. 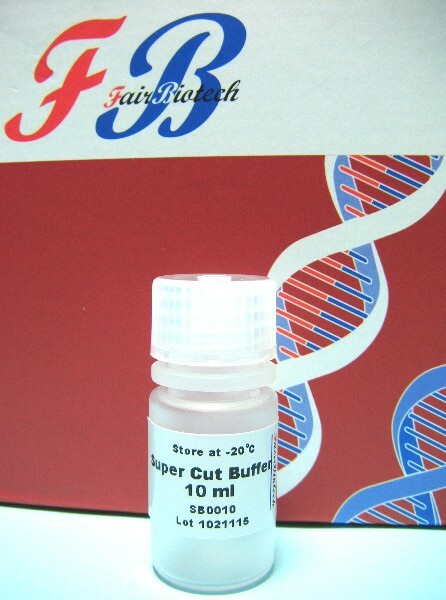 Super Cut-Buffer is 10X concentrated. Simply add a 1/10 volume to the final reaction mixture. Additional BSA is not required.